Faith is a female entrepreneur in a male-dominated industry, drywall. She comes from a long line of tradesmen. Both grandfathers. And her own dad. She’s accomplished in the trade specializing in high-end residential construction, but she’s also an accomplished business operator. She knows her stuff. But she’s struggling with something she thinks should come more naturally. Celebrating when her company achieves a victory. It’s not uncommon. 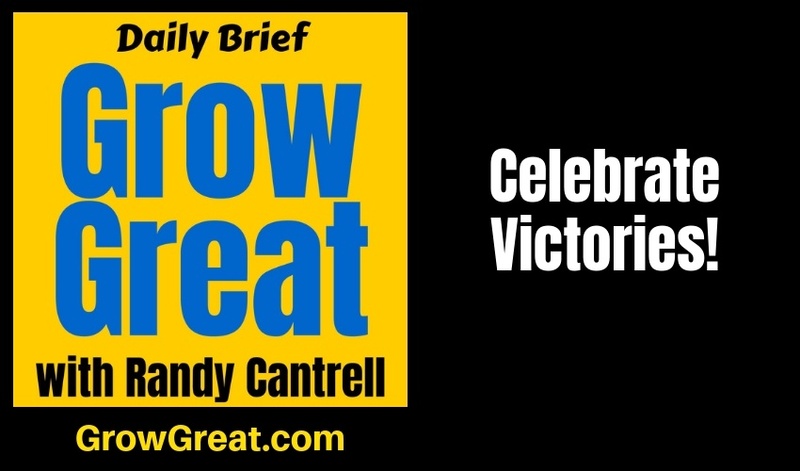 Many leaders and business owners don’t know how to celebrate victories. It’s like everything else. You have to learn how so don’t shy away from figuring it out. Let’s talk about some things you can consider. You don’t have to be the birthday clown! Too many entrepreneurs endure the pressure of being the birthday clown of the celebration. Get that out of your head. You’re not the focal point. Nor are you the entertainment. You’re the leader, responsible for making sure the celebration happen. You’re the leader, the one leading the parade to show gratitude to the troops for achieving victory. You likely had birthday parties thrown by your mom when you were little. Your folks did the work. They showed they loved you. And okay, maybe your dad dressed up like a clown. So nevermind. 😀 Listen, the hired birthday clown doesn’t love you. Your parents do. You knew that. This isn’t much different. Herb Kelleher of Southwest Airlines passed away some weeks ago. Herb was a grand birthday clown. He was a tremendous celebrator of victories. It was one of his strengths, but it was just who he was. His personality was ideally suited for big, audacious celebrations. And for the smaller, everyday acts of recognition, too. Read about Herb. Don’t do the heavy drinking he did 😉 but there may be something to his ability and willingness to celebrate the people of Southwest Airlines. I’d argue that it was a big contributor to the culture that created such a successful airline. Some of you are comfortable showing off in public because you’re very extroverted. Others of you are like me, more introverted. The good news is that no matter how you’re wired, you can lead the celebration. You can be like your parents were during your birthday parties – the ones making it happen because they loved you. You can be like Herb – the one making it happen because he loves you and because he loves a party! Be yourself. Find your own path. Victories have to be defined. Else it’ll be just another old hat, meaningless celebration. Faith’s challenge is pretty ordinary. “What exactly should be celebrated?” she wonders. Sidebar — rant alert — it drives me nuts that some companies have regularly scheduled celebrations. They pigeonhole things to celebrate into the calendar based on the schedule. Employees aren’t impressed. It’s too forced. Too disingenuous. Don’t do that! Here’s my viewpoint – big achievements deserve celebration, the extraordinary and remarkable accomplishments. Great effort with a willingness to fail in the effort to grow is worthy of celebration, no matter the outcome. That’s it. I’m being honest. That’s it. Now, let’s define a few things though so you clearly understand. We’re talking about CELEBRATIONS. I make a distinction between celebrations and acknowledgments, or recognition. Well, kinda sorta. I believe strongly in constant recognition and acknowledgment. I believe strongly in a culture of celebration. These can be private or public. Sometimes it’s appropriate and powerful to simply let a person know you’re aware of their success and contribution. Other times it’s better to shine a spotlight on somebody in front of their peers. Read the situation and do whatever you think is best. *Give a kid a birthday party every day and it’ll become ordinary very quickly. You’ll end up with a ruined kid who is entitled. My preference is that celebrations remain extraordinary. Something special. I also like them to be unexpected, or at the very least, to be conducted only when warranted. I hate scheduled celebrations. And I don’t mean something is achieved so you plan a celebration in advance. I mean calendared celebrations that just always happen, then the company finds things to celebrate. Foolish! Did your company’s fiscal year end December 31st? Then when the final numbers come in and you figure out that the team hit the goal and exceeded it, then it’s a BIG victory worth celebrating. One of your sales teams lands a major deal after months (perhaps years) of work. The deal gets signed. Time to celebrate. Time to recognize that victory publicly I think. Celebrations vary based on the victory. Just like real life, huh? Birthdays are great, but getting married trumps an ordinary birthday. So does having a child. Think over the milestones of your life: birthdays, wedding days, births of children, births of grandchildren, new jobs, job promotions, launching a business, and so on. I get that we can celebrate something every day. I celebrate waking up alive every morning. 😉 But we need and want these to be special events that shine a light on remarkable events, not ordinary events. Faith wonders if she should throw a companywide party. Maybe. Maybe not. Celebrations based on the victory aren’t all the same. And owners or leaders aren’t the same. Herb celebrated in ways I never would because, well, because he was Herb. I’m not. I’m not a party animal like Herb was. I can tell you some things I personally would never do. I don’t share these as truths you should embrace. These serve to illustrate how personal these decisions are for leaders, and how your beliefs impact things. One, I wouldn’t impose on people – and if I did, I’d include their significant other or a plus one. We spend so much time together it just never made sense to me that all the employees have a big blowout and spend more time together without including the one person who is important to each employee. Let me include my wife, for instance, and that’s different. Now we’re able to enjoy the celebration together. Two, I wouldn’t provide alcohol. I don’t drink. Never have. Yes, it’s a religious conviction. I don’t judge people who choose to live differently, but I would never budge on this. This isn’t nearly as controversial as it once was. There was a time when open bars were commonplace in most company events. Due to liability issues and safety concerns, it’s grown increasingly less common. My decision isn’t based on any of that, but it may be worth considerating for you. Three, I wouldn’t likely conduct some big company-wide blowout during off hours. It’s just not who I am. I go back to point one, I wouldn’t want to impose on people. I’d much prefer to do something during hours so people’s lives aren’t disrupted. So how would YOU celebrate? Sometimes all hands on deck and let’s recognize some special accomplishments. That’s the order of the day. Sometimes it’s a memo that goes out informing the company that our sales team has just landed a major piece of business and we name the team members. Sometimes it’s a bonus paid to people for performance above the goal. Sometimes it’s an unexpected gift card with an acknowledgment of special effort or achievement. Don’t celebrate ordinary. Don’t celebrate just for the sake of celebrating. Challenge people to perform at celebration-worthy levels. When they do, don’t hesitate to get too wrapped up in how you go about it. Always remember the objectives. To make them feel appreciated and respected. To shine the light on their accomplishments. To let the entire organization know you care. About them as people and about the work they produce.